Ok, I confess, I use Outlook -not because I’m a great fan of Microsof, but because it’s the one piece of software I have found that makes no mess of synchronizing with my pda. There may be other tools out there, but time is a luxury I don’t often have. However, there is one thing which I have always thought was a big downside of Outlook, and that is that it’s not a web-based application like the Google apps, especially because I really like them. Much to my surprise I found a tool which I can’t & shouldn’t keep to myself, as it’s just too perfect for me! Meet Google Calendar Sync. It’s a free online Outlook backup! From the moment you’re online, you have your calendar at hand, even if you’re working on a public computer in, say, the city library. 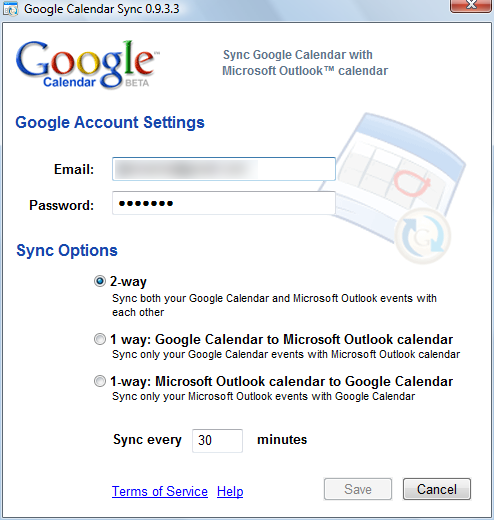 Google Calendar Sync runs in your system tray and synchronizes every 120 minutesn although you can change this in 15 min. should you want to do so. You can tweak it so that the synchronisation only goes one way (only from Outlook to Google, for instance) or both ways. This is a no-brainer. Go & download it. Now.